Which Vitamins Are in Carrots? Carrots are the second most widely consumed root vegetable in the United States, according to the U.S. Census Bureau. Although potatoes may be the perennial favorite, carrots still have a lot to offer. These sweet, earthy vegetables are low in calories, a good source of fiber and incredibly versatile. They’re also packed with vitamins, making them an inexpensive – and far tastier – alternative to taking a multivitamin. Carrots don’t actually contain vitamin A, but they’re an excellent source of beta-carotene, the antioxidant carotenoid that your body can convert into vitamin A. This fat-soluble nutrient is important to immunity, organ function, eye health and visual acuity – it helps your eyes adjust in dimming light. One cup of raw, chopped carrots provides about 50 calories and 430 percent of the daily value for vitamin A, according to the U.S. Department of Agriculture. Cooked carrots are an even more concentrated source, with about 530 percent of the recommended daily value per cup. Carrots are also an excellent source of vitamin K. Although your body can manufacture this fat-soluble nutrient from bacteria in your gut, you still need a small amount each day to protect against deficiency. Vitamin K is mainly required for blood to clot, but it’s also thought to play an important role in building and maintaining healthy bones. A 1-cup serving of raw chopped carrots provides 21 percent of the daily value for vitamin K, while a serving of cooked carrots delivers closer to 27 percent of the recommended daily value. Carrots provide vitamin C too. This antioxidant nutrient plays an essential role in the production of the tissues that make up your blood vessels, bones, teeth, gums, muscle and skin. It also supports immune system function and helps your body absorb the iron in beans, grains and other plant-based foods. According to the USDA, a cup of chopped, raw carrots supplies about 13 percent of the daily value for vitamin C. Because the water-soluble vitamin is degraded by heat, however, cooked carrots are about 40 percent lower in vitamin C than the raw variety. Including carrots in your diet will boost your intake of several important B vitamins. While these water-soluble nutrients are primarily responsible for helping your body convert carbohydrates, protein and fat into energy, they’re also involved in other processes – vitamin B-6 helps assemble amino acids into proteins, while thiamine supports nerve and brain function. A 1-cup serving of raw, chopped carrots provides 9 percent of the daily value for vitamin B-6 and 6 percent each of the daily values for thiamine, niacin and folate. As you might expect, cooked carrots are slightly lower in B vitamins. 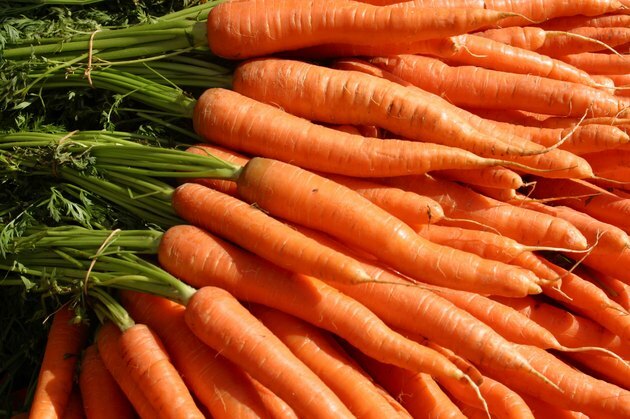 Many of the health benefits associated with carrots come from the vegetable's high beta-carotene content. To maximize these benefits, it’s best to cook carrots and serve them with a small amount of fat. The vegetable’s beta-carotene becomes more accessible when its tough cell walls are slightly broken down, and fat helps your body absorb beta-carotene. Carrots that have been roasted or sauteed in olive oil make a heart-healthy side dish. Steamed carrots can be pureed and used to make a naturally sweet condiment for grilled fish or a rich, creamy soup. Does Cooking Bell Peppers Affect the Nutrition?